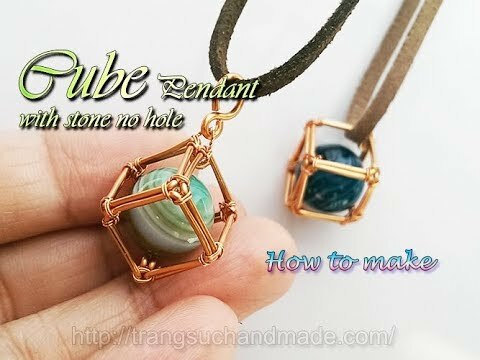 Wire Wrapped Open Cube Pendant Tutorial for Captures Loose Beads or for a Rubik's Cube! Vietnamese wire artist, Lan Anh Pham, has a great way of capturing large beads without actually wiring them to the frame. The focal is loose. This open cube pendant tutorial looks deceptively easy but it is actually very hard to make so many corners precise and neatly! She has a fascinating and very innovative way of making the cube. So this tutorial is a must see! She uses 20 G and 28 G wire with a 12 mm bead. She is very experienced and pretty much creates by eye. If you aren't at that skill level yet, use a ruler and marker pen to indicate where the bends need to be. And expect to practice a lot before a perfect cube results! Her alternative design suggestion for a crystal festooned Rubik's Cube is brilliant! Note that her instructions are just for the frame of the cube. I love how some people's minds work. Figuring out how to manipulate one piece of wire and another to make a cube is brilliant! This is a neat way to show off a bead or a marble. She certainly has a unique way of approaching a wiring situation! I would never have thought to do it the way she does it.